Hummingbird is a complete solution for API testing, but not only for API Testing. It features a world-class test editor to help testers run test cases faster and easier, hides technical complexity of different type of services, provides a unique and friendly user interface. No special technical skill is needed to test a web service. It come with a service simulation module to let you simulate the behavior of decencies of your application: Test completely and test earlier, no more need to wait until the dependency service is ready. It includes a test automation engine allows you to build and run automated tests either from the Hummingbird Application or the Hummingbird CLI (Command Line interface). To instantly import your services definition, Hummingbird has also an Extension Designer, allows you to import, manage and maintain Web Services from WSDL. You can then share the extensions with the team. Hummingbird CLI: A command line application allows to run automated test and service simulation without user interface, ideally it can be integrated with your favorite continues integration platform. 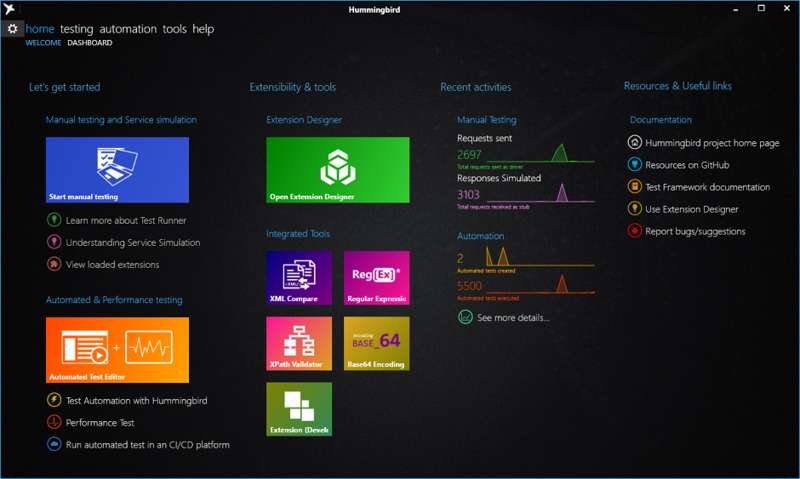 Hummingbird is based on an open architecture allows customizing the application to meet your needs: Either implements a new service protocol, provides a graphical user interface to edit special test data or make a new service simulation. You may learn and use Hummingbird Test Framework to build new extensions. In additional, Hummingbird is also built with a Modern UI framework: Hummingbird UI which gives you better user experiences than any other similar software. Multi-condition based response for service simulation.